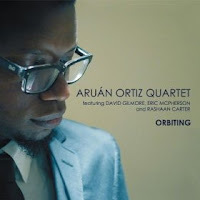 Aruan Ortiz was one of the outstanding contributors to Esperanza Spalding little known first album, Junjo. His playing is calculating and well developed. I freely admit that I don't own much other than his previous quartet record and the Spalding album but I really believe he is a serious rising talent. Only on the scene for a few years, he is slowly becoming a well known name within the scene. His style at times reminds me of a young Chick Corea. His second (fourth as leader) album with his quartet, Orbiting is a wonderful and elegantly executed session that takes chances when needed and stays reverent on others. "Orbiting" features a set of stellar performances by Ortiz and Gilmore. Ortiz seems to move freely and applies a great deal of emotion with each chord. Gilmore's patterns add a nice groove that also turns bluesy on the next track "The Heir." This number includes a number sparkling movements by Ortiz and McPherson that ascend into a massive crescendo towards the end. Ortiz shows adventure and inspiration with his version of Ornette Coleman's "WRU." A good dose of improvisation by Ortiz and Carter. Their movement together is fluid yet pulsating. Deep, emotional and intensely rewarding. Aruan Ortiz has produced a superb collection that pretty much everyone will find a big surprise. Orbiting is modern yet still rooted in tradition. Highly Recommended.